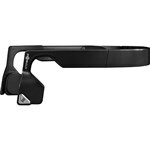 Aftershokz Bluez 2 Open Ear Wi..
Aftershokz Bluez 2 Wireless Bo.. Bone conduction technology uses vibrations to transmit sound waves directly to the cochlea OpenFit assures unmatched ambient sound awareness and extended comfort PremiumPitch patented dual suspension transducers guarantee the finest bone conduction audio Nanotechnology treatment effectively repels sweat when used while working out Dual microphones deliver clear communication even in noisy environments Safe sound is our #1 priority. The award-winning Aftershokz Bluez 2 are the only wireless headphones to offer uninhibited situational awareness, complete with a sound quality that will shock you. A patented design and bone conduction technology guides mini vibrations through your cheekbones to your inner ears, delivering sound without plugging or covering them. Exceptionally lightweight and comfortable headphones, this unmatched open ear listening experience from Aftershokz is further enriched through innovative technologies that make it possible-and safe-to tune in to music or voice communication without tuning out the world. Purchase includes a breathable storage pouch, micro-USB charging cable, adjustable tension band, reflective sticker. AfterShokz Bluez 2 open ear wireless stereo headphones - safe, comfortable, responsible. 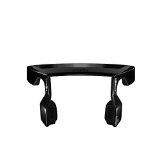 Aftershokz Bluez 2 Open Ear Wireless Stereo Headphones, AS500, C.. 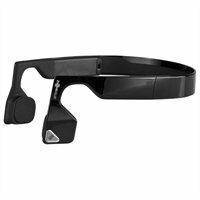 I have been using the Bluez 2 for a few weeks now and here are my comments to help other buyers.Pros:- Bone conduction actually works. How I can tell is that, by comparison to regular headphones, if I plug my ears I can still hear the audio much better than if I were to do the same with headphones.- You will be able to hear the environment around you.- No issues pairing to my Samsung Galaxy S4. It pairs quickly and connection holds up well about 25 feet.- Good microphone quali..